Introduced in 1984, the Contax T is a high quality, exceptionally compact 35mm rangefinder camera manufactured in Japan by Kyocera. The camera is manually focused utilizing a coincident rangefinder. The lens, a multicoated, unit-focusing Carl Zeiss Sonnar 38 mm f/2.8 (5 elements in 4 groups) focusing to one metre, retracts into the camera body, where it is covered by the hinged lens cover. This same cover, which superficially resembles the bed of a folding camera, is also used to extend the lens from the body - in a similar way to the Minox 35. The lens has a manual diaphragm that stops down to f/16 with 7 blades. The electronic behind-the-lens shutter is automatically set by the camera's aperture priority exposure system, with speeds from 8 seconds to 1/500th. Approximate shutter speeds are indicated in the viewfinder using LEDs. 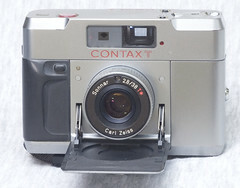 The camera lacks an accessory/hot shoe, but came with a Contax T14 electronic flash unit (two AA batteries) that attaches to the side of the camera and was controlled by the Contax T's silicon photocell. Designed by FA Porsche, the camera's body makes extensive user of titanium, and Kyocera's expertise in ceramics is showcased by the use of a synthetic ruby shutter release. The meter's ISO setting is manual. Film advance is by manual lever, but the frame counter is electronic with an LCD display. The T also lacks an exposure lock feature, but has a backlighting button which increases exposure by 50%. The camera operates on two MS76 silver batteries. It was available in either silver or black finish. The camera has developed something of a cult status and demands high prices (> $300) on the used marketplace. It is reported to have been a favorite of celebrated photographers Henri Cartier-Bresson and Costa Manos.